A native New Yorker, born and raised in the Bronx, Marc Blatte is a Grammy Award nominated songwriter/producer who has worked in the forefront of the New York music scene for over thirty-five years. He also co-founded a hip-hop record label and lived to tell the tale. He lives part time in New York City and part time in Nicaragua. This is his first novel. "Reading Humpty Dumpty Was Pushed, the pages flew. I went through them like money. 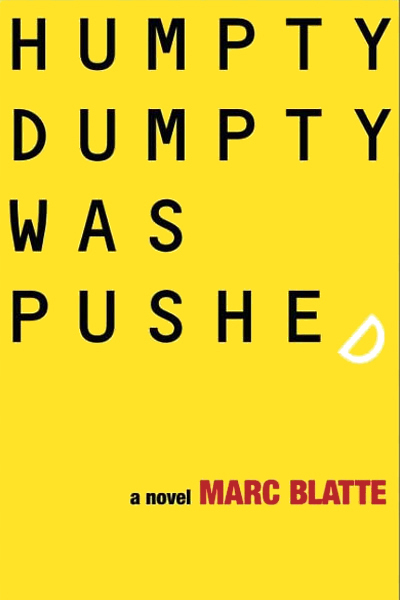 Marc is a natural-born storyteller, as incapable of writing a boring sentence as he was in his former life of writing a lackluster melody"
"Humpty Dumpty Was Pushed is the fast-paced debut mystery by Marc Blatte. Part police procedural, part thriller, part hip-hop noir, it will take you places that no other book has gone before, all with a style that's freakishly relaxed and absolutely authen"
"They say you should never judge a book by its cover, and certainly not by its title, but come on, is a title like Humpty Dumpty Was Pushed irresistible, or what? The cleverness of Marc Blatte's edgy debut thriller doesn't end there."